British Thoracic Society BTS has released its updated Guideline for bronchiectasis in adults which has appeared in Journaql Thorax. Perform baseline chest X-ray in patients with suspected bronchiectasis. Perform a thin section computed tomography scan (CT) to confirm a diagnosis of bronchiectasis when clinically suspected. Perform baseline imaging during clinically stable disease as this is optimal for diagnostic and serial comparison purposes. Consider investigation for bronchiectasis in patients with persistent production of mucopurulent or purulent sputum particularly with relevant associated risk factors. Consider investigation for bronchiectasis in patients with rheumatoid arthritis if they have symptoms of chronic productive cough or recurrent chest infections. Consider investigation for bronchiectasis in patients with Chronic Obstructive Pulmonary Disease (COPD) with frequent exacerbations (two or more annually) and a previous positive sputum culture for P. aeruginosa whilst stable. Consider investigation for bronchiectasis in patients with inflammatory bowel disease and chronic productive cough. A panel of investigations should be performed to establish the underlying cause of bronchiectasis. Co-morbidities and past medical history should be recorded in patients diagnosed with bronchiectasis to identify relevant and possibly causative disease such as rheumatoid arthritis, COPD, asthma, gastro-oesophageal reflux disease and inflammatory bowel disease. Measure full blood count, serum total IgE and assessment of sensitisation (specific IgE or skin prick test) to Aspergillus fumigatus in all patients with bronchiectasis. Serum Immunoglobulin G (IgG), Immunoglobulin A (IgA) and Immunoglobulin M (IgM) should be performed in all patients with bronchiectasis. Consider measuring baseline specific antibody levels against capsular polysaccharides of Streptococcus pneumoniae in all patients to investigate for specific antibody deficiency. If pneumococcal antibodies are low, immunise with 23 valent polysaccharide pneumococcal vaccine, followed by measurement of specific antibody levels 4–8 weeks later. Test for cystic fibrosis (according to NICE Guidelines for Cystic Fibrosis (CF)) in patients with supporting clinical features, for example, early onset, male infertility, malabsorption, pancreatitis. Test for Primary Ciliary Dyskinesia (PCD) (according to ERS Guidelines for PCD Diagnosis) in patients with supporting clinical features, including a history of neonatal distress, symptoms from childhood, recurrent otitis media, rhinosinusitis, or infertility. Sputum cultures should be performed in all patients with bronchiectasis for routine and mycobacterial culture. Which patients should be taught airway clearance techniques? Teach individuals with bronchiectasis to perform airway clearance. Offer active cycle of breathing techniques or oscillating positive expiratory pressure to individuals with bronchiectasis. Consider gravity assisted positioning (where not contraindicated) to enhance the effectiveness of an airway clearance technique. Do not routinely use recombinant human DNase in adults with bronchiectasis. Consider the use of humidification with sterile water or normal saline to facilitate airway clearance. What is the evidence for long term anti-inflammatory therapies in bronchiectasis? Do not routinely offer inhaled corticosteroids to patients with bronchiectasis without other indications (such as ABPA, chronic asthma, COPD and inflammatory bowel disease). Do not offer long-term oral corticosteroids for patients with bronchiectasis without other indications (such as ABPA, chronic asthma, COPD, inflammatory bowel disease). Do not routinely offer phosphodiesterase type 4 (PDE4) inhibitors, methylxanthines or leukotriene receptor antagonists for bronchiectasis treatment. Do not routinely offer CXCR2 antagonists, neutrophil elastase inhibitors or statins for bronchiectasis treatment. Consider long term antibiotics in patients with bronchiectasis who experience 3 or more exacerbations per year. 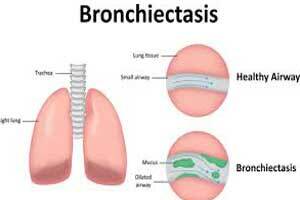 Does long term bronchodilator treatment improve outcomes for patients with bronchiectasis? Use of bronchodilators in patients with bronchiectasis and co-existing COPD or asthma should follow the guideline recommendations for COPD or asthma. Offer a trial of long acting bronchodilator therapy in patients with symptoms of significant breathlessness. Reversibility testing to beta 2 agonist or anticholinergic bronchodilators may help to identify patients with co-existing asthma but there is no evidence to suggest that a response is required in order to benefit from bronchodilators. Offer pulmonary rehabilitation to individuals who are functionally limited by shortness of breath (Modified Medical Research Council (MMRC) Dyspnoea Scale ≥ 1). Consider the use of inspiratory muscle training in conjunction with conventional pulmonary rehabilitation to enhance the maintenance of the training effect. Consider transplant referral in bronchiectasis patients aged 65 years or less if the FEV1 is <30% with significant clinical instability or if there is a rapid progressive respiratory deterioration despite optimal medical management. Consider earlier transplant referral in bronchiectasis patients with poor lung function and the following additional factors: massive haemoptysis, severe secondary pulmonary hypertension, ICU admissions or respiratory failure (particularly if requiring NIV). Offer annual influenza immunisation to all patients with bronchiectasis. Offer polysaccharide pneumococcal vaccination to all patients with bronchiectasis. Consider long term oxygen therapy for patients with bronchiectasis and respiratory failure, using the same eligibility criteria as for COPD. Consider domiciliary non-invasive ventilation with humidification for patients with bronchiectasis and respiratory failure associated with hypercapnia, especially where this is associated with symptoms or recurrent hospitalisation. Do not routinely recommend alternative treatments (for example cough suppression, nutritional supplementation, complementary therapy/homeopathy, supplemental treatments) as part of the management of patients with bronchiectasis. Consider patients with chronic P. aeruginosa colonisation at higher risk of bronchiectasis-related complications. Perform regular sputum microbiology screening for patients with clinically significant bronchiectasis to monitor for pathogens and detect new isolation of P. aeruginosa. Does eradication of potentially pathogenic microorganisms improve outcomes in patients with stable bronchiectasis? Offer patients with bronchiectasis associated with clinical deterioration and a new growth of P. aeruginosa (1st isolation or regrowth in the context of intermittently positive cultures) eradication antibiotic treatment. (first line treatment: ciprofloxacin 500–750 mg bd for 2 weeks; second line treatment: iv antipseudomonal beta-lactam ± an iv aminoglycoside for 2 weeks, followed by a 3 month course of nebulised colistin, gentamicin or tobramycin). Discuss with patients the potential risks and benefits of starting eradication antibiotic treatment versus clinical observation following a new growth of P. aeruginosa in the context of stable bronchiectasis. This will include consideration of the likelihood of achieving sustained eradication, the risk of developing chronic infection, and the risk of adverse events with each management approach. Offer patients with bronchiectasis associated with clinical deterioration and a new growth of methicillin-resistant S. aureus(MRSA) (1st isolation or regrowth in the context of intermittently positive cultures) eradication. This should be attempted especially in view of infection control issues. Offer IgG therapy to all patients with common variable immune deficiency (CVID) and x linked agammaglobulnemia (XLA). Consider IgG therapy for patients with specific polysaccharide antibody deficiency and/or IgA deficiency or IgG subclass deficiencies with absent/impaired pneumococcal vaccine antibody responses who continue to have objective evidence of bacterial sino-pulmonary infection and progressive disease despite appropriate management of bronchiectasis. Treat GORD symptoms in patients with bronchiectasis according to existing NICE guidance. Should treatment of bronchiectasis be altered in the presence of co-morbidities? Consider a trial of inhaled and/or oral corticosteroids in patients with bronchiectasis and inflammatory bowel disease (IBD). Ensure optimal control of asthma and allergies in patients with both bronchiectasis and asthma. Monitor patients with co-morbid COPD and bronchiectasis as they are at higher risk of death. Patients with bronchiectasis and autoimmune conditions should be carefully assessed for autoimmune related lung disease and often require long term follow up in a secondary care setting. Patients with bronchiectasis who require disease modifying antirheumatic drugs (DMARDs) or biologics for rheumatoid arthritis should be referred to a chest physician for further assessment before treatment is started. All patients with bronchiectasis should undergo routine monitoring in order to identify disease progression, pathogen emergence and modify treatment where necessary. Individual or cohort segregation based on respiratory tract microbiology results is not routinely required for patients with bronchiectasis.